Like all other valuables, your car also deserves special care on your part so that your whole family may keep enjoying the facility evermore. Being a costly thing, your car is also in high demand of the professional thieves looking forward to it impatiently. You can always beat the thieves if you just remain particular about the following physical and technological based precautions like a car locator app, etc. These are not highly expensive and are very easy to follow in your routine operations with your car. Here are these. Never forget to keep your car locked all the time even when you are driving it. When you have parked it, be cautious to take the keys out of the ignition after locking all the doors, glasses and sunroof. Always remember never to leave your car started or unattended. Keep it in mind to take along all your valuables when leaving your car all alone. The sight of the valuables inside tempts the thieves to make an attempt. Be very particular about the registration book of your car and never leave it inside when you have parked it. Thieves may get away from the police by showing them the registration book you have left inside. Make a very secret place to keep it inside if it is not feasible for you to carry it all the time. Avoid going through the notorious high crime areas especially during late night. Never hesitate to take an alternative route even if it is a bit longer. At night time, always park your car in a well-lit area to keep it safer from the thieves who usually prefer to work in darkness. Look around very cautiously for the suspects, if any, when you are parking your car in garages, parking lots, gas stations, etc. Have your car’s VIN (vehicle’s identification number) etched on each of the windows. It will help you a lot if your car gets stolen unfortunately. The thieves usually do not attempt to erase them or get all the glasses replaced. Apart from the physical methods, you can also protect your car by using the technological solutions developed over the years. Following are the necessary measures you can take confidently. A steering wheel lock can be used to lock the steering in its place, thus preventing all wrong to drive it away. This useful device works in two styles: horizontal and vertical. Horizontally, it can be used on the steering either making 3 ‘o clock or 9 ‘o clock position with its attached parts. Vertically, you can attach one end of the lock with the clutch pedal and the other end locked on the steering wheel, making it impossible for anyone to turn the steering wheel. This is also a very useful device often used by police against the illegally parked cars. It locks the tire strongly in its place and you can go shopping for hours at a stretch. A kill switch is a more advanced device which when fitted disrupts the supply of electricity to the fuel pump, thus making it impossible for the car to get started. This switch is kept hidden and allows the car to start only when you flip it down. This irritates and frustrates the thieves so much so that they have to leave your car eventually. Install an anti-theft system in your car and get it connected with your smart phone. This system will make it possible for you to track and recover your car even if it gets stolen out of hard luck. Thieves are reluctant to steal a car with such a system as they do not like to return the things once stolen. 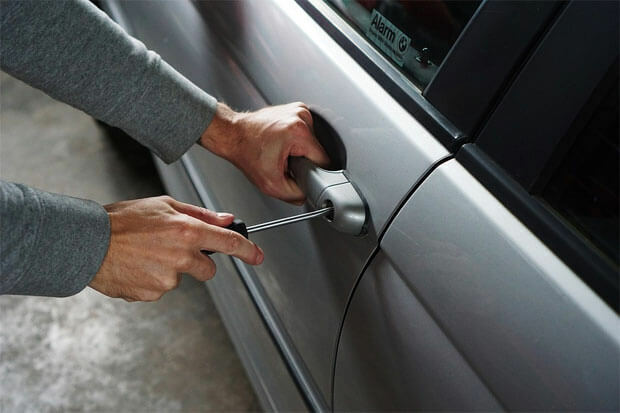 By using the above mentioned ways , you can definitely reduce the chances of your car being stolen by the carjackers.